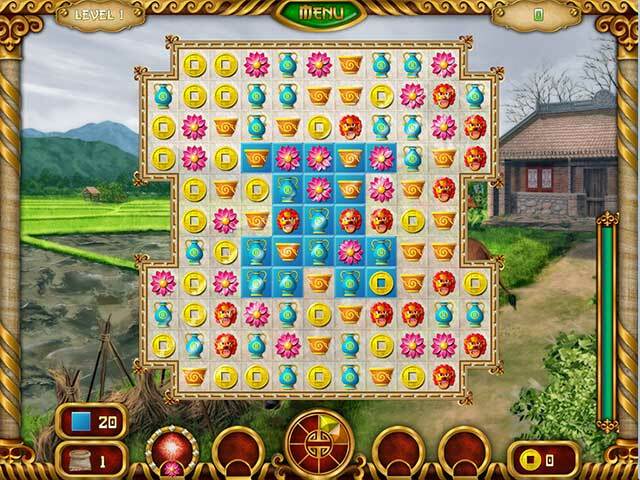 Rated 2 out of 5 by lotusdk from not enough you can do it better. You didn't put some real work into the game, the drawing is very bad and simple, the color look like, sunburn. the story line well, its oki, but, I will safe my money for a real 3 match. Rated 2 out of 5 by biscuitsmama from A Rather Ho-Hum Match 3 Rise of Dynasty is a Match 3 game with a slight builder component. We play round after round of Match 3 boards to earn coins which allow us to rebuild the new dynasty, the previous one being destroyed after years of war and rebellion. The game starts out okay but after about ten minutes of play I thought it became quite ho-hum and boring. The graphics seem to be sub-par and low budget - perhaps due to the coloring of the tokens, which is drab rather than deep, and after playing a few rounds of the game they all seemed to look quite the same. If the coloring was more intense and items were clearly distinguishable, it would have improved the artwork of the game. I definitely did not like the waves light that periodically moved across the board, which I personally found distracting and annoying. Perhaps later in the game, the tokens will change but I didn’t hang around long enough to find out. Not only were the graphics not to my liking, the repetitious flute music drove me nuts and I had to turn it off. The tempo was a bit too fast and had it been slower and more relaxing it would have been far more appealing. It would also have been nice if the developer had provided an option to select alternate soundtracks. Speaking of alternatives or choices, there are very few options in the game, although there is a relaxed mode if you don’t want to play “beat the clock.” The gameplay is straightforward. 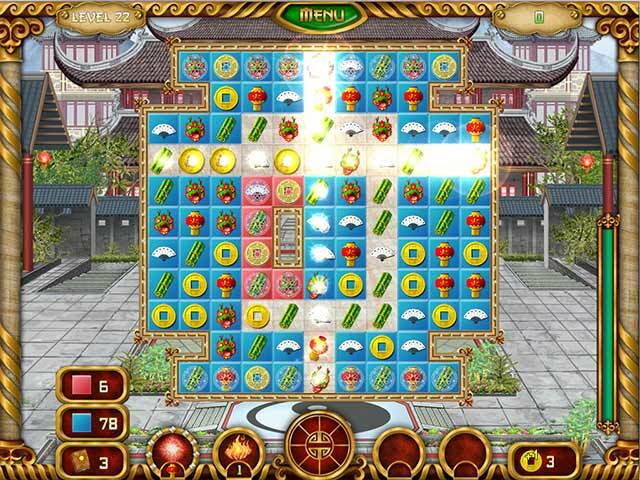 We play board after board of matches to earn coins, which are then spent to rebuild China’s new dynasty. 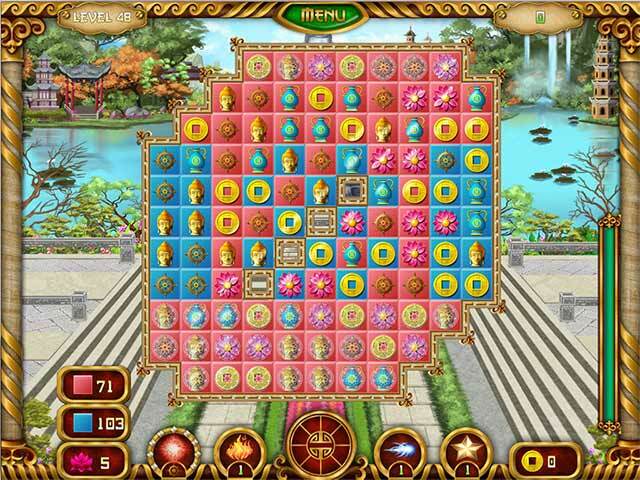 As we play each board power-ups are earned by making longer or more complex matches. The power-ups can be very helpful in some sticky situations, particularly as we move to higher levels in the game. Once we remove the colored tiles on the board there is a special item that must be dropped to the bottom in order to complete the level. As far as the builder component of the game, it is rather automatic and, IMHO, a huge opportunity was missed by not giving the player a selection of items to purchase. If the player could actually choose what to purchase it would have added another level of challenge to the game and qualified as a true builder game. Basically, just earning coins to purchase the item available is rather boring in the end. What could have been a promising and good Match 3/Builder game is nowhere near the quality and fun of other games in this genre such as Mystika. Some of you might like the game but I couldn’t wait to uninstall it. As always, I recommend that you try the demo to see if this is a game you might like. Rated 2 out of 5 by dachsy from A Mediocre Match 3 Nothing special here. Perhaps it could be best described as almost an OK Match 3 game. This game appears to be from a Japanese developer and it doesn't help that the attempt at the spoken English introduction is less than convincing...sounds like the narrator is still learning the English language. There are 60 levels to conquer in either Timed or Untimed mode. 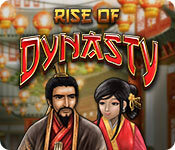 You are tasked to rebuild a village from a previous dynasty. You gain coins from playing to pay for the resources. Nothing new there. The graphics are Good, but not excellent, with the symbols being rather too indistinct from each other. My biggest gripe however, is that the game board is too small, making the symbols harder to see. All the usual power ups are available, but their associated sound effects are somewhat lacking in power. Ambient music, whilst pleasant enough, quickly gets a bit annoying, and I had to almost turn it off to feel comfortable. One positive aspect is that matches can be made whilst tiles are still falling. Overall, I thought this Match 3 game was of a technical standard of about 3 years ago. It just does not measure up to what is expected by today's players, and so is not a buy for me.